One of the most powerful tools we can acquire for getting better is to figure out how much getting better there is to be done. 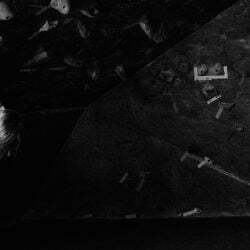 I first wrote the Novice Bouldering Program in 2010, re-released it a couple of years back, and am revisiting it again now. Why? Because it is one of the most effective programs out there. Here’s the thing, though…nobody thinks they are a novice. One of the great things about web analytics is that you get to see great detail on which articles are getting the most traffic. Of course, Advanced Bouldering is crushing, followed by a distant Intermediate, and an almost-unread Novice article. Thanks for reading it, dad! Here’s the thing: climbing is complicated enough – a complicated training plan is only useful when a simple one has not worked. Even when you plateau, I urge you to revisit simpler methods first, before adding complexity. What follows is the Novice article, and a few tweaks to the plan I have made over the last couple of years. I know…nobody’s a novice. Nobody wants to be thought of as one, and no one likes to consider themselves one. 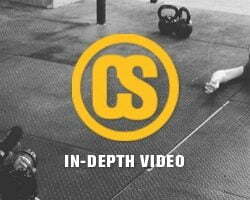 However, in building climbing training programs, we’ve adapted a really useful classification template from strength coach Mark Rippetoe that works very well. Depending on how long a climber has been at it and how much he climbs each week, his training program design differs. We categorize these levels as Novice, Intermediate, and Advanced, and there’s more to it than the grade you can boulder. The distinctions come as indicators of “training age” – a measure of how much of your life you’ve spent actively trying to get better at this sport. Training age is a really neat thing. Let me give you an example: take a avid climber of 20 years and a triathlete with the same amount of experience. Have the two switch sports for two years of dedicated training on the world’s best training plan. At the end of those two years, what do you think will happen? Will the triathlete be a better redpoint climber? Will the climber win in a head-to-head triathlon? I think you know the answers.In the early stages of climbing…say the first 2 years, almost anything will cause a boulderer to get better. At this level, simply adding any kind of climbing or (in some cases) even general physical activity is the best path to improvement. “Training” is a waste of time for climbers at this level; their climbing should be looked at as practice and measured in hours. 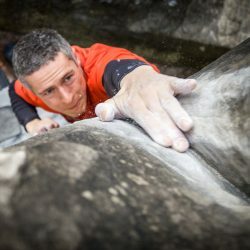 Anyone who has not put in at least one to two thousand hours (and by this I mean actual hours of movement – not hours spent at the crag or gym) in the sport is probably still a novice when it comes to training age.An intermediate-level climber begins to really know failure (and the desire to succeed) on routes and problems. Bouldering, hangboard sessions, and disorganized “training” can be employed to help this climber improve. Usually, by the time a climber has reached this level, he is already at 60-80% of his genetic potential for strength and endurance. Progress really flattens out for the intermediate and these climbers will often hit a long-term plateau; the result of progress simply taking too much work. Many climbers will never leave this plateau, a spot business guru Seth Godin describes as “the dip.” The intermediate stage can last several years and will take a climber to around 90% of his genetic potential. Training for intermediate athletes has to be organized and tracked, but probably not to the degree and advanced climber’s must.Advanced climbers are rare. These are the ones who continually creep up the improvement ladder, even years into a training career. They follow structured plans, and expect to perform at top levels only a few short weeks each year. These climbers are generally well-rounded, and don’t have a particular “style.” Their hard-won efficiency decreases the stress or overload that normal training plans can provide. The better you are, the harder you must train.Rippetoe describes the advanced (Weightlifting) trainee well:”Advanced trainees are very close to their genetic potential. Huge amounts of training result in relatively small improvements. Advanced trainees require fewer movements than intermediates. Advanced trainees require large volumes of intense work to disrupt homeostasis. This means the stress required for progress will creep nearer and nearer to the maximal tolerable workload that the body can perform and recover from.”Don’t be deceived. There are climbers performing at very high levels that have not reached the advanced stage; they simply have more potential that they have not tapped. Likewise, there are boulderers that might climb only V8 that have attained advanced status simply because they are performing very close to their absolute genetic limit. Beginning boulderers should keep a training log. In this log, you should track the details of every climbing session. Note warm-up, each problem’s grade and style, how you performed on it, and anything significant that occurred in the session. This could be a particular send or an injury. Overload should progress through a training month. This means the total number of problems you complete at any given grade or the grades you send should increase steadily over three weeks’ worth of sessions. The fourth week of each month is an unloading week where you will aim to do half the volume of week three. Lean toward trying harder grades rather than building more volume. The months should progress, too. You should see better performance in November than you did in the spring. I like climbers to track three numbers for each session. First, the total number of problems. Second, the V-Sum (add up all the V-grade numbers of the problems you did). Third, the Average V for the session. The last number is simply the V-Sum divided by the number of problems. These three numbers are key to building progressively harder training session-to-session.3. If you can’t do a few pull-ups or you can’t do a one-legged squat (pistol squat), you might consider a few days each week or resistance training. 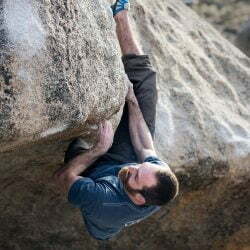 Bouldering is a massively strength-oriented sport, and some total body strength will go a long way. Our Foundation Strength workouts are a good place to start, though good weight training plans are pretty easy to find. Avoid group high-intensity training as well as bodybuilding programs. The 3 weeks on 1 week off program is a really good one. A climber can continue to see improvements here for years, so no other program is really necessary until you see a hard plateau. There is some wiggle room, too: if you get sick or have to travel, you can slide the off-week around a little bit and not blow the program. Take the off week seriously, though. If you’re pushing it hard on your three weeks on, you’ll slowly be “digging the hole” – really stressing your body to adapt. That fourth week is your body’s chance to recover and catch up. If you’re doing it right, the strongest you’ll climb will often be just after a recovery week.Once you start to go flat, assess what’s going on. Are you getting really good at one type of problem? Are you weak on certain moves? Are you having flexibility or technique issues that hold you back? These things should all be addressed before you decide to intensify your training. Once you feel you’re climbing a pretty good grade on a variety of rock types and angles, you might be ready for more advanced training. A warning, though…this plan is way more fun than the ones I build for intermediate and advanced trainees. Before you decide to move on up to a “higher level” program, make sure you’ve seen this one through.